Ovens are a staple appliance in the kitchen. Almost every household in the United States has one. It’s where dinners and desserts are made–classic dishes that bring the family together, ones that the whole family loves. From meat loafs and lasagnas to cookies and pies, they are all made and bakes using a good oven. There are two main types of ovens, depending on how you keep it operational. One type is the electric oven, where you use electricity to start up the machine that keeps it going. With a push of a button, the oven heats up by the jumpstart of the electric charge. The other type of oven is the gas oven, which has a more complicated operational process. Gas ovens use pilot ignition to work. Pilot ignition works with a pilot light or a small gas flame where it is responsible to light the burner of the oven. As the thermostat is turned on and increased, the burning flame gets bigger and envelops the thermocouple bulb of the oven’s safety valve. The safety valves open, allowing for the gas to flow to the pilot light to ignite the burner. Both types of ovens are available in the market for everyone to purchase. Some residential places like condominiums and apartments do not allow or discourage the use of gas ovens due to safety reasons. However, gas ovens are still are a popular choice for homes because of its affordability. Gas oven users must just know safety precautions and how to recognize if a gas oven is malfunctioning. In this article, we shed light on how gas ovens work and the implications and cautions of using it safely and successfully. These parts work together to successfully bring heat to the gas oven for you to use. 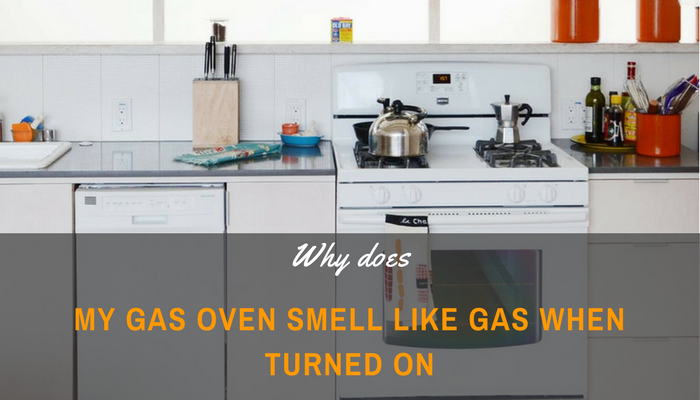 Should your gas oven emit the smell of gas? The answer is no. Not at all. However, when you first start your oven, there might be an unusual odor in the air that should go away after within a few minutes. This unusual odor is not the same as a smell of gas. Rather, it is the smell of unburned gas, which some people describe like the smell of rotten eggs. 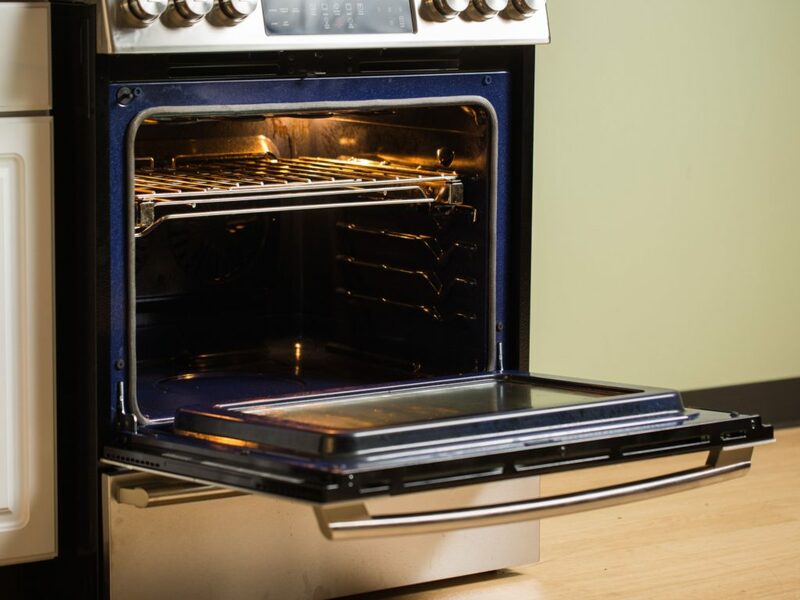 Unless your oven has been serving you for at least 15 years, your oven should never emit the smell of gas when you turn it on or especially while you use it. When you smell gas when the oven is turned on, there might be a possibility of leakage, which can lead to very dangerous mishaps. As soon as you smell the odor of gas, you should shut down the oven and promptly call your gas supplier. You should not touch any electrical switches as it might give you an electrical shock and could possibly lead to fire. Your gas stove must always be kept clean and maintained. Most providers often warranty and free annual check-ups. Checking for possible leakage is usually done by service provider professionals. But if you are confident enough to check by yourself, here is a step-by-step guide on how to find and fix a leak. Remember to do this ONLY if you are positive that there is no open flame, no electrical switches nearby, and the gas is turned off. (1)Open the gas valve. When you hear a hissing sound, that means that there is a puncture in your gas tank and a leakage. (2)Spray a 50-50 solution of water and dish soap using a spray bottle to the gas valve and the supply line and look for bubbles. If bubbles are forming around these connections, you would need to replace the gas supply line. If you see that leaks are coming out anywhere in the gas line, immediate replacement is a must. (3)Call your service provider or a technician to do the next steps for you. If you can’t find the leak, they should be able to do so. You should never turn the gas on or use the gas oven until you are sure that there are no leaks coming from the connection lines. Years of usage always equate to depreciation of appliances. Any of your appliances won’t last forever. Especially when it comes to kitchen appliances, you should always check if there are parts that need to be replaced, or if the whole unit needs to be thrown out. Gas ovens must be trashed when leakage can no longer be fixed. It is always better to be safe than sorry!